Headlines tell us about failures of corporate boards, weaknesses in strategic leadership, and controversies over tax arbitrage. Within businesses and public sector organisations, however, we also see exploration of new forms of ownership and new paths of accountability, seeking to create value for owners, broader social impact and business sustainability. The BU research cluster on Regulation, Corporate Governance and Taxation brings together scholars and students from across a wide range of disciplines to conduct research into both the failings and the experimentation. We seek insights that can arise at the intersection of leadership studies, finance, accounting, business ethics, institutional analysis, law and economics to advance knowledge in the diverse field of corporate governance. Corporate governance spans a wide range of issues in business and management, drawing upon disciplines ranging from law and accountancy, economics and finance, to strategic management, leadership and ethics. This research cluster brings their efforts together to build new projects and develop new scholars seeking to explore questions confronting businesses, their investors and the boards of other types of organisations, too. Our research examines boards of directors and their relationships with investors, as well as regulators, gatekeepers and watchdogs with whom they interact. A sub-group of the cluster specialises in taxation and tax policy. The cluster has a strong interest in building on the body of scholarship and the efforts of their scholars to research new questions. We want to build new research capabilities, too, by welcoming new scholars to the field. The cluster welcomes applications from candidates for doctoral and other research degrees. 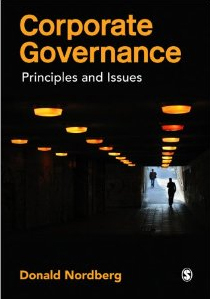 Donald Nordberg’s book, Corporate Governance: Principles and Issues, was published in 2011 by Sage Publications. Research by Donald Nordberg and a former student, Rebecca Booth, featured prominently in a paper on trends in board evaluation in Europe published by the UK-based proxy voting agency Minerva-Manifest in March 2019. The RCGT cluster was out in force at the British Academy of Management’s symposium on corporate governance in small and medium-sized companies at the headquarters of the Association of Chartered Certified Accountants in London in February 2019. Organised by Dr. Leslie Spiers, the symposium heard papers from scholars from as far afield as Bangladesh, and guest talks by representatives of the Institute of Directors and, from Washington, the International Finance Corporation, part of the World Bank Group. Also giving papers were Spiers, Professor Steve Letza, Azeez Balogun, and Donald Nordberg. For a third year, Donald Nordberg is organising the corporate governance track at the 2019 British Academy of Management conference at Aston University in Birmingham. Dennis Seaman presented an early glimpse of his doctoral study to a February 2018 London symposium of the corporate governance special interest group of the British Academy of Management. Rebecca Booth and Donald Nordberg wrote to the UK Financial Reporting Council endorsing its plan to extend the recommendation of external board evaluation to all listed companies. They also urged attention to the need for professionalisation of such efforts as more and more companies that undertake such activities. 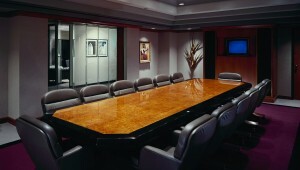 They were contributing to the 2018 consultation on revising the UK Corporate Governance Code. Booth, who earned her MSc in Corporate Governance with Distinction at BU, is a board service practitioner at Carey Group Guernsey. Bchr Alatassi presented a paper developing a conceptual framework for corporate governance in Islamic finance to the 2017 British Academy of Management conference at the University of Warwick, based on work towards his PhD studies. Leslie Spiers presented preliminary findings of his PhD studies to the Conference of Professors of Accounting and Finance in Birmingham, an event run under the aegis of the British Accounting & Finance Association. The University of Oxford’s Law Department invited Donald Nordberg to contribute to its widely read Oxford Business Law Blog, summarising his working paper called “Cadbury and a road not taken”, a look back at the development of the UK Corporate Governance Code. The blogpost also looks forward to the “fundamental review” of the code planned by the Financial Reporting Council in the autumn of 2017. Rebecca Booth and Donald Nordberg have collaborated on a pair of conference papers concerning board evaluation theory and practice. The empirical study of directors’ experience of the practice was presented to the International Corporate Governance Society in Rome in early September 2017. A review paper that builds a framework for practice was presented the following week to the British Academy of Management conference at the University of Warwick. Booth, a financial services practitioner focused on board development, earned an MSc in Corporate Governance with Distinction from BU. Marg Concannon, who earned an MSc in Corporate Governance with Distinction at BU, and Donald Nordberg have collaborated on a paper examining how boards of directors work on strategy in the increasingly regulated environment after the financial crisis. Using theories of liminality developed in anthropology and reinterpreted in organisation studies, it identifies practices of strategising that seek to reassert creativity when regulation places emphasis on compliance. Professor Steve Letza has edited a special issue of Economics and Business Review providing practical and theoretical developments in corporate governance. Tahani Mohamed took her PhD research on the link between tax discipline, corporate governance, and firm performance to December 2016 and March 2017 events of British Accounting and Finance Association. “Trump, Foucault and Pre-Modern Governance”: That is the theme of a reflection on a post-modern interpretation of history, statecraft and corporate governance by Donald Nordberg, associate professor, and available from Social Sciences Research Network. It compares Trump’s first days in the White House with the French philosopher’s reading Machiavelli’s Prince and movement away from the divine right of kings to the development of Moderism and the Enlightenment in the 18th Century. It’s an extended version of his blog-post on TheConversation.com. A companion essay at SSRN, “First and second drafts of history,” considers the relationship between journalism, social science research, and historiography in the age of Twitter and endless, unthinking communicative action. The twinned essays now appear in Geopolitics, History, and International Relations.